Gamers don’t have the most flattering stereotypes when it comes to physique. A known sedentary pursuit, gaming doesn’t often help its players stay svelte. There are exceptions of course, but the physically undemanding nature of games can’t honestly be denied. There are many examples of developers trying a variety of techniques to keep players moving and motivated by their entertainment. Motivation has always been the crux of the issue for many. With so many other distractions and entertainments vying attention it can be hard to fit in the drudgery that is exercise. Blending the two has always seemed like an ideal marriage of practical benefits and entertainment. Some companies have started developing products for exercise in VR, but the dedicated space requirements for equipment and added price (as discounted as they may have become, VR is not by any means “cheap”) makes the addition even more prohibitive. Augmented Reality games like the series Zombies Run! (now in its 6th season) and Pokémon Go help get folks out and about in the real world and can be great motivational hooks. Personally, I have had a hard time keeping up with these AR games. Zombies, Run! is certainly fun but application errors I experienced and lapses between runs (due to weather and schedules) made it harder and harder to keep up with the story and keep interested. Pokémon Go was certainly a good motivator for a while, but the issues with distance tracking effectively discarding so much of my progress greatly reduced the game’s hold on me. 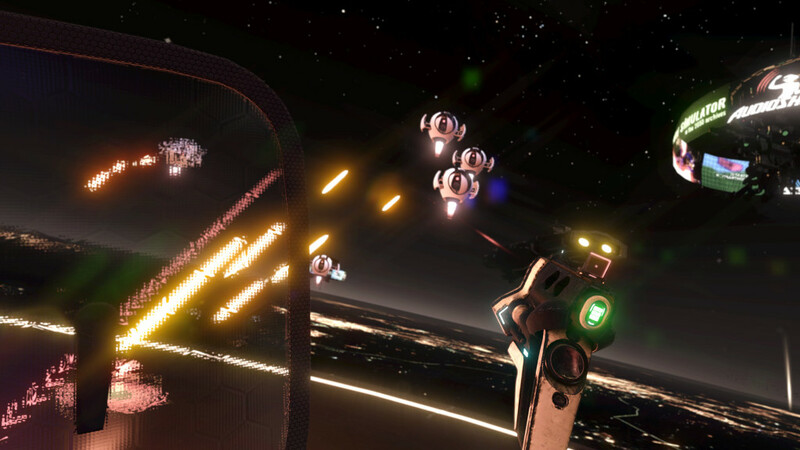 Our current generation of VR headsets offer plenty of opportunity for motion, but it tends to be in a limited play space. Some folks have taken it upon themselves to augment their VR play with wearable weights. As Reddit user leppermessiah1 proved with his self-constructed VR 50 exercise challenge, the results can be impressive. Using a weight vest, wrist weights, and anklets Steve and I have started experimenting playing Space Pirate Trainer here and there as a form of home exercise. It’s been an interesting experience so far. The physical challenge is daunting as the slow-mo Matrix like bullet dodges get off balancing fast when you are wearing a 20 pound vest. I’d had a few sessions with just the wrist and ankle weights that felt like a nice workout, but the weight vest brought it to a whole other level. I was sweating and panting like a dog as I tried desperately to fight off wave after wave of drones. It was utterly exhausting, but still very fun. Despite my aching muscles I still found myself wanting to try for a the high score “just one more time”. It’s hard to say if this will continue to become a routine, if the enjoyment of the game will be enough motivation, or if at some point the novelty will wear off. In the interim it is an interesting challenge to add to the VR experience, and perhaps one day a developer will hit on some kind of integration that make VR exercise the norm.